Gather... Autumn has fallen upon us! The ideal time to enjoy cool breezes and rich colors. Enjoy our Autumn 2015 look book, decorated with seasonal bedding, and know that Autumn is yours to enjoy in comfort. Combining autumnal hues and wonderful fabrics, this season's slumber will be fondly remembered. Now's also the perfect time to prepare for winter hibernation! DEWOOLFSON's down pillows, comforters and signature duple silk covers are essential to building a warm and cozy bed. Many creative minds and skilled hands merge to make a lovely bed and we believe the ideal bed foundations start with our perfectly filled and stitched down and silk fillers. Have a look. We are certain you will agree. Curious to learn more about the products you see here? Click on most any image and you will be taken to that page on our merchant website - dewoolfsonlinens.com. We hope you'll find our look book as inspiring as the cool breezes in autumn! s w o l l i P n w o D l l 750 fi DEWOOLFSON速 comforters, pillows, and featherbeds are individually filled and sewn from the finest materials and shipped from our North Carolina factory within 48 hours. We use only hand-select European white goose down or feather fills, covered with some of the world's finest European downproof fabrics, including your choice of cotton cambric, batiste, sateen, silk, and an eco-friendly organic cotton. Our comforters are available in up to five warmth levels, and can have additional down added anytime within a year of purchase (charging only for shipping and the cost of each additional ounce of down). Our down pillows are fully adjustable for firmness within a year of purchase (charging only for shipping and the cost of each additional ounce of down). As always, orders for custom sizes and fills are gladly accepted. DEWOOLFSON速 brand fine down products for the home for over 30 years. Silk-filled comforters are the perfect addition to DEWOOLFSON's line of fine sleep products. 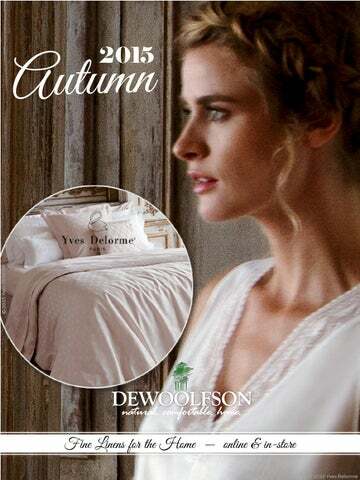 DEWOOLFSON's ever-popular, all-season blanket is filled with white down, is covered with a white brushed polyester fabric and is finished with a traditional white satin binding. Silk, a natural insulator that stays cool in the summer and warm in the winter, is one of the oldest known textile fibers and the preferred fill for sleeping comfort in many countries. ▪ Filled with the finest hand-pulled silk floss. ▪ Covered with a lightweight cotton voile. ▪ Suitable for a moderately cool bedroom. Our Silk Puff, envelops you like the fluffiest down comforter. Its expanded loop stitching allows the silk to loft like down. The silk forms a batting that clings to the cotton fabric so that it will never bunch or shift. And when used inside your cotton duvet cover, it is guaranteed to stay in place. Naturally hypoallergenic. Dry clean only. DEWOOLFSON LINENS 9 45 2 N C H i g h w a y 1 0 5 S . B a n n e r E l k , N C 2 8 6 0 4 U . S . A . © 2 015 DE WO OL F S ON D OW N I N T ’ L ., I NC .